You can invite as many people as you like to your party, but if you aren’t able to keep them fed and watered they’re only going to stay for so long. That’s true of a Friday night rager, and it’s true if you’ve built an £80 million venue for that party, so Dundee’s food and drink scene has a key role to play. On an autumnal Wednesday in ‘Scotland’s Sunniest City’, we land in a rainstorm so powerful that it basically destroys our shoes. We were hoping to dive into the city’s culinary scene and see what we could come up with; we didn’t think we’d need an actual snorkel. Still, it’s ideal weather for comfort food, which means the seminal Dundee institution that is Clark’s. Students, workies, school children (including this writer, back in the good old days); have all been through the doors of the 24-hour bakery and come out the other side covered in pastry. We smash a bacon roll into our faces and save a steak pie – a dead ringer for the Desperate Dan classic cow pie – for later. From there it’s a short hop around the corner to one of the new guard of Dundee’s food and drink scene, 71 Brewing. 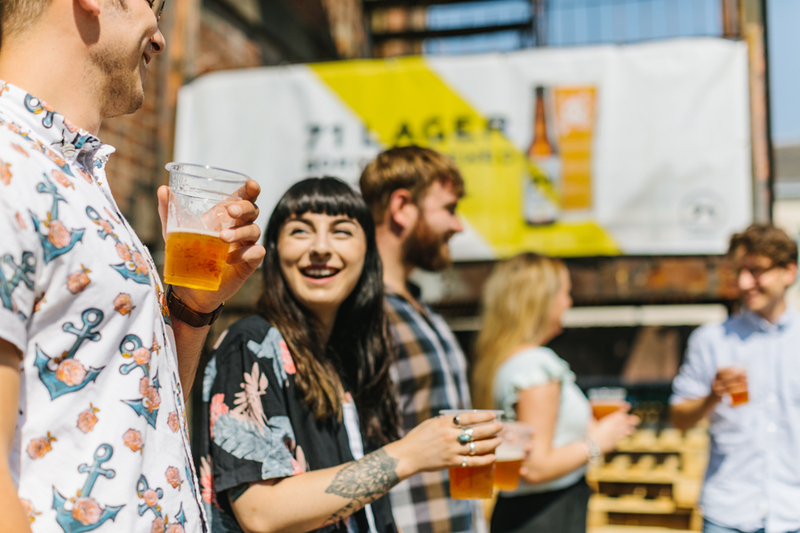 The beer from the city’s leading craft brewery can be found in bars across Dundee and beyond, with an impressive range for visitors and local beer-lovers alike to work their way through. Personally, we have a soft spot for their Raspberry and Lychee Berliner. That beer, and the others that make up the 71 range are great examples of modern Scottish craft brewing but borne from a piece of Dundee’s industrial past. 71’s home is on the site of the former Blackness Ironworks, and the building itself is an impressively hefty chunk of that past, all brownstone and vintage murals. It’s just five minutes from the Perth Road – home to Dundee Uni, Duncan of Jordanstone art college, and a host of indie shops and cafes – but it feels a bit further, the long arm of big-budget art projects taking its time to work its way out from the city centre. That space, by the way, makes for exciting viewing – it’s an enormous warehouse spot ideal for gigs and exhibitions, and one that property developers in Glasgow or Edinburgh would have earmarked for luxury apartments before the end of this sentence. If the sight of 71 is something to behold, five minutes around the corner, you can smell Verdant Spirits’ home before you see it. Rounding an unassuming industrial estate ramp, you’re punched in the face with the smell of Christmassy botanicals. Inside, the distillery (currently focussed on gin, with rum to follow shortly) is all shiny metal, concrete and lovely pale wood. Next door is a late-1800s mill engine house that, thanks to a somewhat protracted planning discussion, currently doubles as a comically-oversized office. Those local producers are out there, and everyone we speak to acknowledges the importance of the V&A in shining a light on Dundee, but also for the food and drink scene to throw itself into that spotlight and jump up and down grabbing people’s attention. And there’s plenty to be excited by. On the coffee front, we hit up a number of great places for a flat white – Pacamara down on the Perth Road; New Zealand-inspired cafe The Bach’s bright and airy new location around the back of the McManus Galleries; and the fantastic cafe-meets-clothes shop Daily Grind, just off the main waterfront strip facing onto the V&A. Many of those places are also serving up local coffee, with Sacred Grounds roasters up in Arbroath providing fresh, zesty and chocolatey beans to many of the city’s best coffee places. Then there are the stalwart Dundee classics like Clark’s that frankly deserve all of your attention and money and Fisher and Donaldson with their incredible fudge doughnuts. You’ve had disappointing filled cakes in the past, right? Filling all off to one side, or hidden away right in the middle? Not here; this thing is like a bowl of amazingly smooth custard that someone has baked a cake around, then covered the whole lot in fudge. Probably terribly bad for you, and originally from Fife and not Dundee, but who cares yum custard nom nom nom.